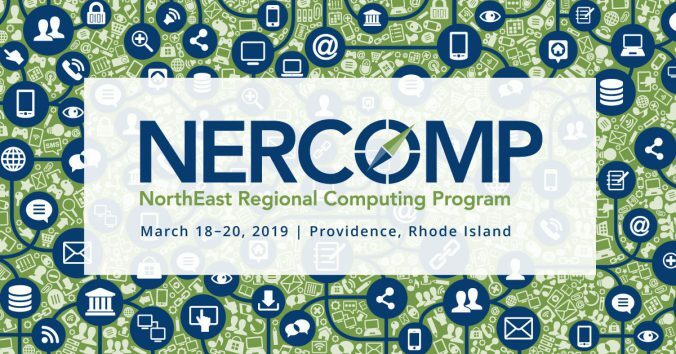 Several Brandeis GPS staff members will be representing the division this week at the NERCOMP 2019 Conference hosted by Educause in Providence, Rhode Island. GPS’s involvement will include a March 20 breakout session on Developing and Launching a Course Refresh Initiative, featuring Brian Salerno, Director of Online Learning and Instructional Design, Carol Damm, Director of Programs and Assessment, and Lance Eaton, Instructional Designer and Faculty Development Specialist. The team will be presenting on the GPS internally-created rubric for assessing the effective design of online courses and our process for refreshing courses. Lance is also presenting on the Accessibility, Availability, and Affordability of Open Educational Resources with a panel that includes Instructional Design and Technology Program professional advisory board member Kevin Corcoran. The NERCOMP Annual Conference is the place where our community of faculty, researchers, learners, and institutions come together to engage, network, and learn from each other’s experiences in advancing innovation and leadership in higher education. The NorthEast Regional Computing Program (NERCOMP) partners with EDUCAUSE to bring together leaders in the higher education IT community from across the region. The NERCOMP Annual Conference plays a pivotal role in bringing together a community of higher education library and IT professionals to build expertise and share information on the latest issues in the field. This conference is the place to connect with peers, share successes (and struggles), and enhance our collective learning. Brandeis GPS offers fully online, top-tier master’s degrees for professionals in today’s most in-demand fields. The Master of Science in Instructional Design and Technology program aims to help students learn to adapt instructional content to dynamic online and mobile platforms. While benefiting from the flexibility of a part-time fully online program, students master how to innovate digital learning with the latest instructional design practices and technologies. Samples of our Instructional Design courses include: Principles of Online Instructional Design, Managing Instructional Design Projects, and Digital Ethics & The Legal Landscape of Instructional Design. At Brandeis GPS, you can take up to two online courses without officially enrolling. This is a great opportunity to get to know our programs and approach to online learning. Learn more about our MS in Instructional Design and Technology, and preview our courses here. You can also contact our enrollment team at gps@brandeis.edu or 781-736-8787. Education technology is constantly evolving alongside the development of new tools, processes and resources. Each year, an expert panel of community members publishes the NMC Horizon Report, which lays out the latest trends and developments in EdTech and identifies new impacts on learning, teaching, and creative inquiry. The report predicts that analytics technologies and makerspaces will likely influence EdTech in 2019. Within the next five years and beyond, educators can expect to see the adoption of more adaptive learning technologies and artificial intelligence, mixed reality and robotics. Brandeis GPS programs are part-time, and 100% online. To learn more about our master’s degrees, request more information or contact the GPS office: 781-736-8787, gps@brandeis.edu.